When thirteen-year-old Leah Stevenson struggles to be thankful in the year 1830, her father teaches her a lesson that she will never forget. With drought oppressing her parents and eight siblings, financial shortage, her mother progressing in pregnancy, and difficult work in the fields of central Missouri, Leah fights to overcome her strong will. She often complains because lack of money means a lack of earthly things for this careless girl. The work is hard and the rest is short for the entire Stevenson family, but it often seems that Leah is the only one who notices. With a calm mother to settle her, and a father who is strong enough to conquer her, the girl slowly puts aside her childish burdens. A sudden tragedy changes the course of the Stevenson’s life forever. It is too late to regret, but not too late to be thankful. Now, even Papa has to force himself to write an entry in the cherished Thankful Book, and Leah finally realizes that, even in genuine poverty, there is something to be thankful for. 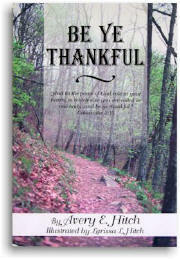 Be Ye Thankful is based on the scripture in Colossians 3:15, which states: “And let the peace of God rule in your hearts, to which also you were called in one body; and be ye thankful.” Full of drama and real-life situations, this book is sure to motivate children and adults of every age to realize the importance of thankfulness and a selfless life in Christ.